A child monk screaming excitedly while zipping across the windy mountain roads on a brand new electric-scooter-that is the picture perfect meeting of the past and the future. 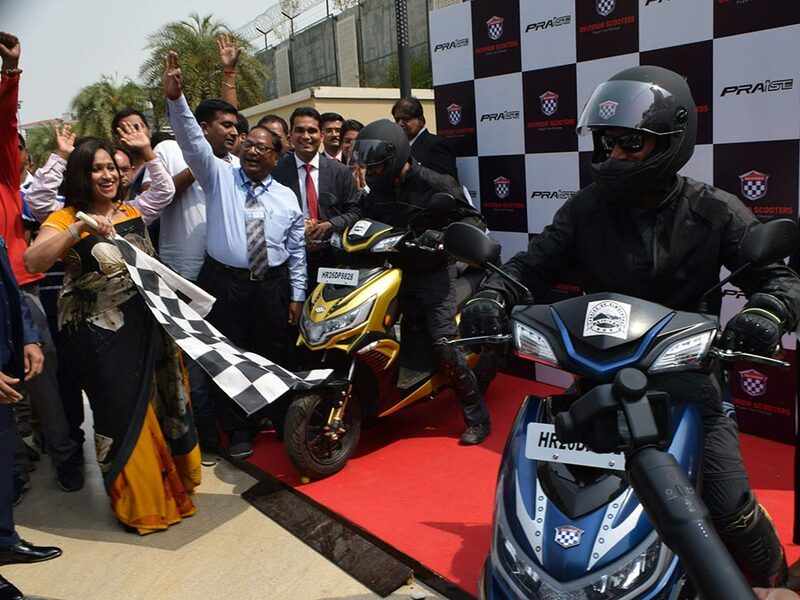 This meeting was realized recently when Okinawa Scooters, India’s fastest growing electric two-wheeler manufacturing company, began a journey of 10 days and 1350 kms with ‘Praise’ – #WheelsOfChange. The historic expedition was the first time an electric vehicle even attempted to scale a height of more than 18000 ft, let alone complete it successfully. 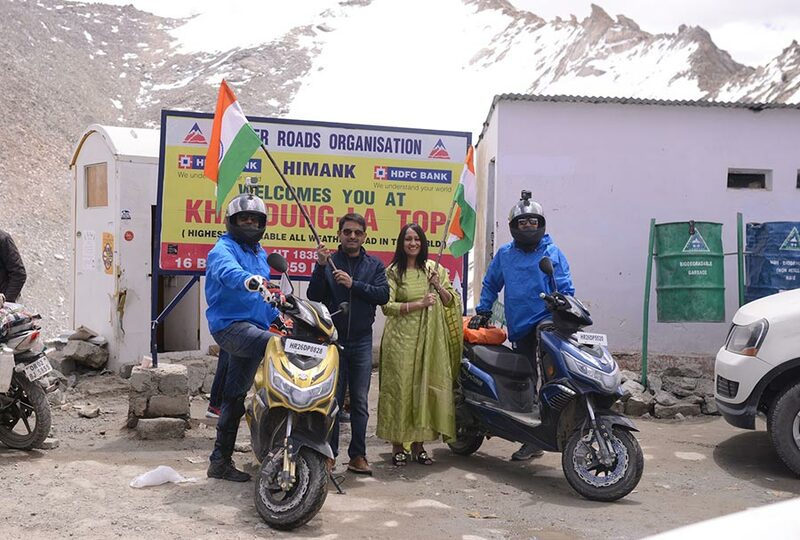 Under the campaign ‘Praise De Himalaya’, the first ever journey of its kind flagged off from Gurgaon in the presence of Okinawa’s Managing Director – Mr. Jeetender Sharma, Chairperson – Mrs. Rupali Sharma and all their PAN India dealers. 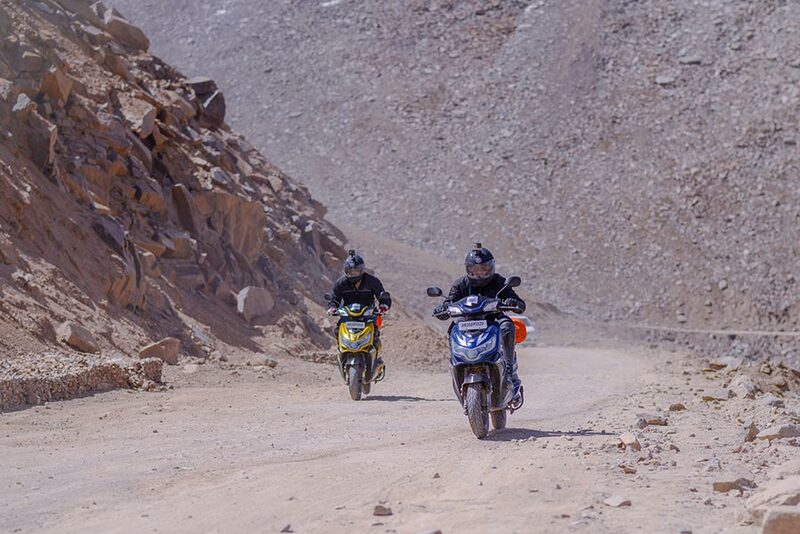 Spanning across destinations such as Ambala, Jalandhar, Pathankot, Banihal, Ganderbal, Sonamarg, Srinagar, Bhimbat, Lamayuru, Leh and finally Khardung La, Praise convincingly conquered the mountains where many petrol and diesel motorcycles run out of horsepower. 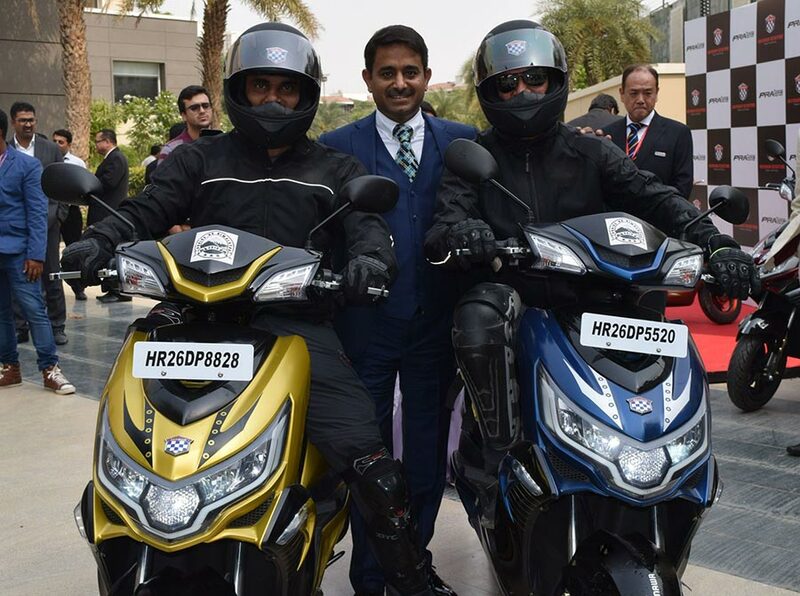 With this journey, the fastest e-scooter on Indian roads has given further proof of its unparalleled power and has definitely made its intentions clear of giving conventional fuel variant automobiles in its category a run for their money! Okinawa’s premium offering, equipped with a Lithium-ion battery, braved challenging climatic conditions, difficult terrains and damaged roads during some stretches. The expedition, which was projected as a litmus test for Praise’s capacity to travel through such long distances, highlighted the magnificent aspects of Okinawa’s unparalleled engineering and hardware quality. Okinawa’s performance parameters, at 55 – 75km/hr under different speed modes and a range of 170-200 km/charge was further complemented by the detachable battery that made it possible to fight for this height. Okinawa’s Praise overcome long range challenge by the main USP of having the Lithium-ion battery for this journey. This new development of detachable Lithium-ion battery, was used as an easy option to just swap it with used battery & charge easily at any stopover at tea stalls, food points in hilly area & making this ride a hassle free ride. Praise’s universally acknowledged telescopic suspension proved its excellence yet again, maintaining a smooth riding experience on uneven roads in different states of disrepair. The e-scooter’s ergonomics, engine power and load-taking capacity were tested comprehensively, with Praise succeeding on every front. 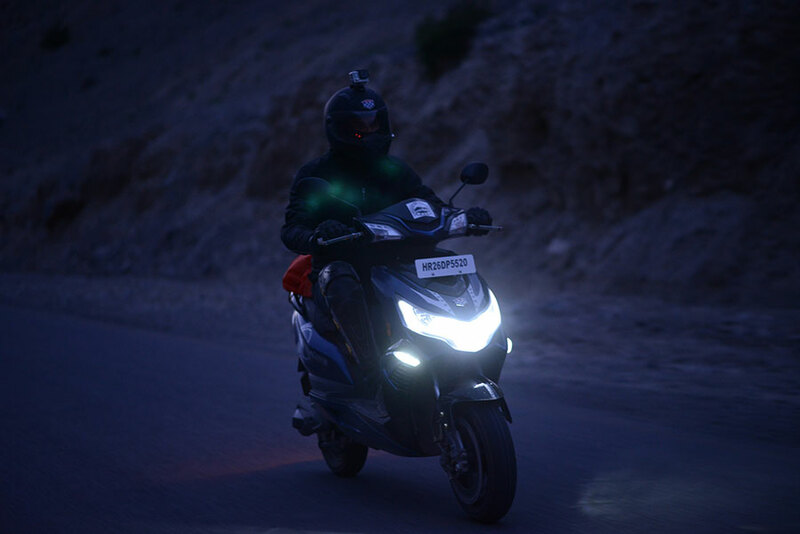 Even after reaching Khardung La, one of the highest motorable passes in India, the scooter showed little signs of wear and tear. At the pass, the e-scooter and the riders were greeted by Managing Director and Chairperson of Okinawa, who were proud of the vehicle’s astonishing feat. 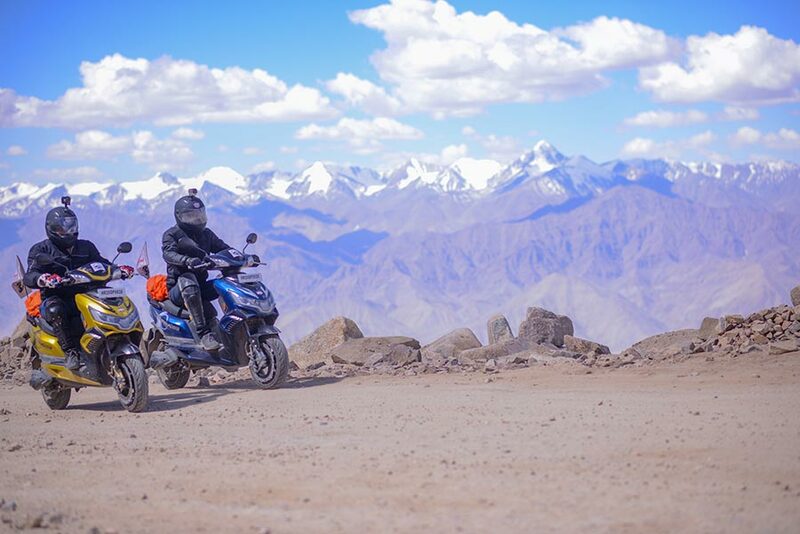 The ‘Praise De Himalaya’ campaign is the first and one-of-its-kind journey of an e-scooter to an extremely high-altitude zone where it is very difficult to attempt two-wheeler expeditions. While many apprehensions were raised on Praise’s ability to complete such a difficult journey, we at Okinawa were confident of our vehicle’s capabilities to complete the trip successfully. It is not every day that an e-vehicle comfortably completes a voyage of 1350 km and reaches a height of 18,380 ft. Through the ‘Praise De Himalaya’ campaign, we wanted to ‘Fight for Height ’i.e. the different psychological barriers and biases that stop a consumer from opting for an e-vehicle. We sincerely believe that Praise’s unique achievement will bring forth a transformation in the way that e-vehicles are viewed in the country. Okinawa’s ‘Praise De Himalaya’ campaign has adequately showcased that its power-packed machines can stand up to any challenge, whether distance or kind of terrain or lack of charging infrastructure – by passing the most rigorous test of taking ‘Praise’ from the plains to one of the world’s highest motorable passes. Okinawa has rejuvenated the entire e-vehicle industry in India by introducing latest technologies, efficient manufacturing processes and a strictly regulated product quality check to ensure complete service satisfaction of buyers. With its cutting-edge engineering and design innovations, Praise has been at the forefront of changing the identity of the e-scooter in India, making it a powerful, sustainable, environment friendly and affordable mobility option ready to rule the roads, whether in the plains or in the mountains!